Taken this morning in Ukie Village. April snow in Chicago can be remedied with a little help from Derrick Rose. If there is anything more pedestrian than complaining about the weather, it is complaining about the weather in Chicago. 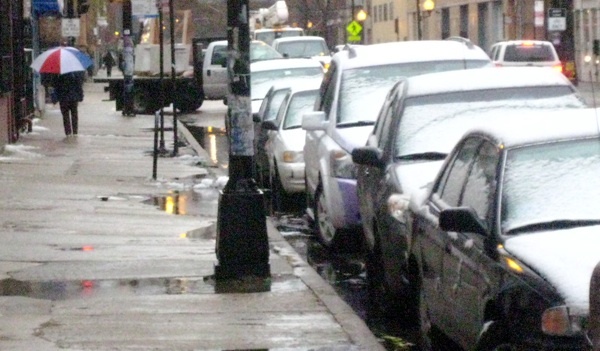 And yet… we’ll one up the latter act of mundane bitching by not only complaining about Chicago weather, but airing our complaints over the Internet. Because waking up and finding slush covering cars and sidewalks in mid-April is akin to rooting for a basketball team that gets off to a promising start (like leading a game for 46 minutes), before a college-age guard with a Jansport packed to the teeth with true grit pisses freezing rain on your parade. If you’re a Pacers fan, Derrick Rose was mother nature unleashing a chilly sneeze right before you were ready to enjoy spring. From Getty Images: Derrick saves his brilliance for the waning moments of playoff game that resembled snow in the middle of April. You’re probably not an Indiana Pacers fan, but this weather may have just made you feel like one. And weather wise, this entire week is not for the meek or easily discouraged. It is for the resolute, those with a glass-half-full disposition, or those with a one-way ticket to Hawaii. But before you pack it in and pop Paxil to get you through May — when we hope you may find refuge in a beer garden — remember this: without the sour, the sweet is never as sweet. And there is hardly anything sweeter than Rose spinning through the lane before gently unleashing an improbable seven-foot teardrop, or a miraculous three-foot finger roll that eeked its way past a forest of limbs. Man Up Chicago hardly endorse the idea that athletes are role models (nor are they arbiters of cool and style), but right now, we think the collective population of Chicago would be wise to unleash its inner Derrick Rose. This means grinding out the majority of a painful, uninspiring game, then sweating droplets of brilliance and excitement once that little ray of sunshine and 70 degree weather becomes the inevitable conclusion. It — the good weather — will happen. Be ready to embrace it when it does. 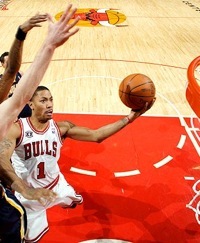 Until then, screw weather metaphors and just watch Rose and company battle the Pacers tonight. Because basketball, in its best form, manifests itself as Paxil, sunshine and fruity drinks with umbrellas in it. It’ll transport you to a place where the slush isn’t on your doorstep, it’s in your hurricane glass, and its coconut flavored.